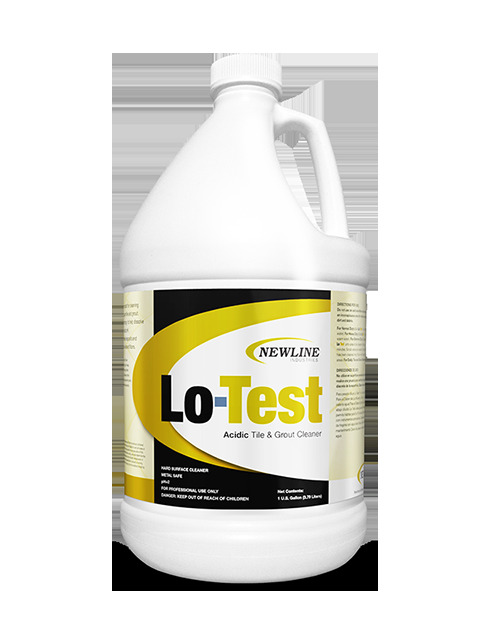 Lo-Test is an acidic pre-treatment for cleaning man-made ceramic, porcelain, quarry tile and grout. Lo-Test helps dissolve grease and oil while maintaining an acidic pH. The low pH eliminates scale, mineral deposits and embedded stains. This unique blend of acid tile cleaner is stable with an aggressive degreaser on the acid side of the pH scale. Lo-Test can also be used as a daily maintenance cleaner when diluted 2 oz. per gallon of water. Directions for use: Use warm water. For daily tile and grout maintenance dilute 2 oz. per gallon. For normal duty cleaning dilute 16 oz. per gallon. For heavy duty cleaning dilute 32 oz. per gallon. For extreme cleaning dilute 64 oz. per gallon. Apply dilution with a clean mop, especially to the grout lines. Allow 5 - 10 minutes of dwell time. Scrub as needed. Extract and rinse with appropriate tools. Mop floor with clean/clear water.